This section describes the basics for planning, installing, configuring, and running an NDB Cluster. Whereas the examples in Chapter 5, Configuration of NDB Cluster provide more in-depth information on a variety of clustering options and configuration, the result of following the guidelines and procedures outlined here should be a usable NDB Cluster which meets the minimum requirements for availability and safeguarding of data. For information about upgrading or downgrading an NDB Cluster between release versions, see Section 4.8, “Upgrading and Downgrading NDB Cluster”. This section covers hardware and software requirements; networking issues; installation of NDB Cluster; basic configuration issues; starting, stopping, and restarting the cluster; loading of a sample database; and performing queries. NDB Cluster 7.3 and later also provides the NDB Cluster Auto-Installer, a web-based graphical installer, as part of the NDB Cluster distribution. The Auto-Installer can be used to perform basic installation and setup of an NDB Cluster on one (for testing) or more host computers. See Section 4.1, “The NDB Cluster Auto-Installer”, for more information. Assumptions. The following sections make a number of assumptions regarding the cluster's physical and network configuration. These assumptions are discussed in the next few paragraphs. Network addressing. In the interest of simplicity (and reliability), this How-To uses only numeric IP addresses. However, if DNS resolution is available on your network, it is possible to use host names in lieu of IP addresses in configuring Cluster. Alternatively, you can use the hosts file (typically /etc/hosts for Linux and other Unix-like operating systems, C:\WINDOWS\system32\drivers\etc\hosts on Windows, or your operating system's equivalent) for providing a means to do host lookup if such is available. In both instances, ndb1 routes ndb1.cluster to a loopback IP address, but gets a public IP address from DNS for ndb2.cluster, while ndb2 routes ndb2.cluster to a loopback address and obtains a public address for ndb1.cluster. 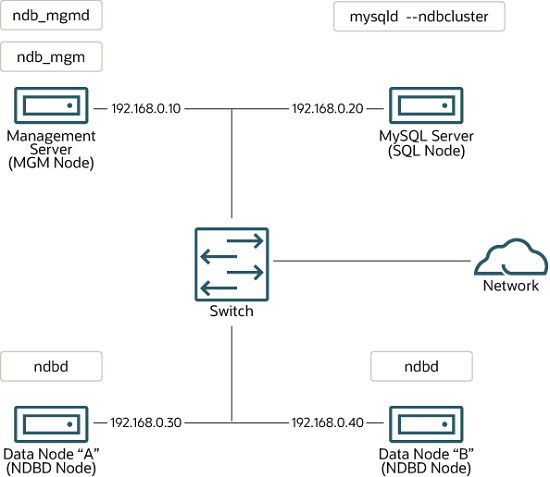 The result is that each data node connects to the management server, but cannot tell when any other data nodes have connected, and so the data nodes appear to hang while starting. You cannot mix localhost and other host names or IP addresses in config.ini. For these reasons, the solution in such cases (other than to use IP addresses for all config.ini HostName entries) is to remove the fully qualified host names from /etc/hosts and use these in config.ini for all cluster hosts. Host computer type. Each host computer in our installation scenario is an Intel-based desktop PC running a supported operating system installed to disk in a standard configuration, and running no unnecessary services. The core operating system with standard TCP/IP networking capabilities should be sufficient. Also for the sake of simplicity, we also assume that the file systems on all hosts are set up identically. In the event that they are not, you should adapt these instructions accordingly. Network hardware. Standard 100 Mbps or 1 gigabit Ethernet cards are installed on each machine, along with the proper drivers for the cards, and that all four hosts are connected through a standard-issue Ethernet networking appliance such as a switch. (All machines should use network cards with the same throughput. That is, all four machines in the cluster should have 100 Mbps cards or all four machines should have 1 Gbps cards.) NDB Cluster works in a 100 Mbps network; however, gigabit Ethernet provides better performance. NDB Cluster is not intended for use in a network for which throughput is less than 100 Mbps or which experiences a high degree of latency. For this reason (among others), attempting to run an NDB Cluster over a wide area network such as the Internet is not likely to be successful, and is not supported in production. Sample data. We use the world database which is available for download from the MySQL website (see https://dev.mysql.com/doc/index-other.html). We assume that each machine has sufficient memory for running the operating system, required NDB Cluster processes, and (on the data nodes) storing the database. For general information about installing MySQL, see Installing and Upgrading MySQL. For information about installation of NDB Cluster on Linux and other Unix-like operating systems, see Section 4.2, “Installation of NDB Cluster on Linux”. For information about installation of NDB Cluster on Windows operating systems, see Section 4.3, “Installing NDB Cluster on Windows”. For general information about NDB Cluster hardware, software, and networking requirements, see Section 3.3, “NDB Cluster Hardware, Software, and Networking Requirements”.